I consider myself lucky. Actually, I think I’m very lucky. The fact that my weight is at an unhealthy level but I have not had to deal with the negative side effects of being obese makes me feel lucky indeed. When I think about all the things carrying around an extra hundred pounds can do to a person’s body, it scares me. However, I haven’t had to deal with diabetes, heart problems, GERD, high blood pressure or many of the other issues that come with extra weight. The question is, how long will my luck hold out? I’m not stupid. I know that it’s only a matter of time before it catches up with me. I’ve known this for a while and it hasn’t been a big enough motivator for change. Lately though, I’ve been paying attention to the quality of life issues that being obese has already caused me. I have sleep apnea and have to use a CPAP machine to keep me breathing at night. I have knees that tend to be more sore than they should and I occasionally hear them make interesting popping sounds when I walk up stairs. My feet hurt a lot and I have to use inserts to provide the extra support that they need. Someone asked me the other day why I don’t wear my beloved Chucks any more and I had to explain that the inserts I use don’t work too well in them so if I do wear them, it causes my feet to hurt too much. I know if I want to improve my quality of life I need to get rid of these extra pounds. That’s why I’ve set goals that I can work toward other than just the number that pops up on the scale. 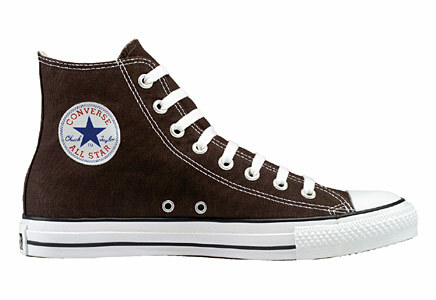 I want to be able to wear my Chucks again and not feel pain after a couple of hours. I hope to be able to make it through the night without having a mask strapped to my face while air is forced through my nose. I want to be able to walk up a flight of stairs without listening to a creaking and cracking sound that is, when I think about it, quite disturbing. In the end, I’m not just trying to lose weight, I’m trying to have a better life. These are concrete and very real results that I can focus on and they help to motivate me to make the right choices. Without these other goals, I would be trying to get to an idea. My weight hasn’t been in the lower 200s in such a long time that remembering what it was like to weigh that little is practically impossible. It doesn’t help that even when I had a healthy weight I felt like I was too big so I don’t have too many memories about what it’s like to be a “skinny person”. That’s why focusing on weight alone isn’t going to cut it. Weighing less is a concept that is ephemeral and difficult to visualize. Not having sleep apnea is much easier to think about. Wearing black canvas shoes that come up past my ankles is concrete. Having the energy to do everything I want to do is something I can latch on to. When I think about it, this isn’t about weight at all, it’s about living the life I want. It’s about having the freedom to live a life free of preventable medical problems. As a Buddhist I try to be aware of the problems caused by attachment to things, desires or dreams. It is possible to have a goal and not be attached to it but it can be hard. If I am to succeed again in losing this weight, I will need to set goals without attachments to them. Eventually, I’ll have to set other goals and have other things to keep me motivated to stay healthy. Being aware that eventually I will have to throw my current goals away as I achieve them is one way to refrain from attachment. I am also trying to be cognizant of the reality that having a healthy weight and having a better quality of life will not do a thing to change my situation. My self, my true self, will not have changed at all. My self will come in a smaller package but it’s still going to have all of its desires and demands and suffering and delusions. While goals are great for getting a better body, I need to maintain a perspective about them that won’t weigh down my mind. If I’m not willing to take the Chucks off my feet once I can wear them again, I won’t be spending too much time on the meditation cushion. I don’t know if you’ve ever tried it, but meditating with shoes on is very uncomfortable. Last night I had the opportunity to do something I hadn’t done in almost 20 years. I was able to play with Pan Fried Steel, a community based steel drum band based out of Yarmouth Maine. The high school I attended was fortunate enough to have a steel drum band and I spent countless hours practicing and playing those drums. It was some of the most fun I ever had playing music. It was great to listen to and fun to play. Audiences always loved it and it taught me just how amazing music can be. Since leaving high school, I have really missed playing. Now, I have found another opportunity to have this great experience. I was amazed at how quickly it came back to me. I haven’t read much music since I was forced to stop playing back in college. I still knew every note and all the musical notations felt like old friends. I think the best experience was being able to hold my own on two of the songs. I had no expectations of coming in and being able to play but these two particular pieces were simple enough that after a quick overview of the music and a survey of where the notes were on the drums I was playing, I was able to keep up and feel like I really played and participated in the group. After I left rehearsal, I was lightheaded with happiness. It was like a drug. I’m still smiling as I think about the experience. This was an experience I wasn’t planning on having. I didn’t specifically go and seek it out. It was one of those things that just happened. One day, I saw a flyer for upcoming performances at an event hall and noticed that there was a steel drum band from Yarmouth playing. I had no idea how they operated or if I could even participate. On a whim, I contacted them and asked about what it takes to be a member. It turns out, all that was needed was a willingness to play. I’ve got that in abundance so I attended the rehearsal last night and had a blast. As I said in my previous post about learning to play the guitar, focusing on music is an amazing meditative practice. I had a very similar experience to the one I wrote about in that post but much more intense. The single mindedness that comes when playing music is the state that a Zen practice cultivates. When playing music, you are just playing. You are with a group of other people who are of a similar mind and are just playing. It is the most visceral example of what Zen Master Seung Sahn called “together action” that I have ever experienced. While I was playing and reading and experiencing music I wasn’t worried about work, I wasn’t struggling with depression, I didn’t feel the need to stuff my face with junk. I just played and it was the most natural thing in the universe. I lost sight of my “I, my me” mind. It’s the closest I’ve ever come to experiencing Samadhi. Now, I am forced to leave that behind as it was in the past. If I try to keep holding onto it, I will only suffer as the rest of my experiences don’t add up to it. I cannot build up expectations of next week’s rehearsal either as it will set me up for suffering if things do not go according to all of the imaginary scenarios I have made. Each practice will be its own experience. Just as each moment is its own moment. Last night I had a beautiful experience and it made me happy. Today, I sit at a computer and type. What is the difference?